Full of amazing art and historic architecture, travelers visiting Trento are in for a special experience full of Italian style. The fantastic scenery combined with the vibrant cultural scene of the city ensure you’ll have a memorable vacation in Trento. Overlooking the city of Trento is the iconic Buonconsiglio Castle, constructed in the 13th century and now a tourist destination and art museum. Close to Trento on the majestic Paganella mountain, you’ll find high-class ski resorts where you can enjoy the fresh mountain scenery. Other interesting sites in the city include the Casa Cazuffi-Rella and the modern MUSE science and natural history museum with activities for people of all ages. A bit off the beaten tourist path, but with a special charm all its own, Trento is a unique tourist destination. 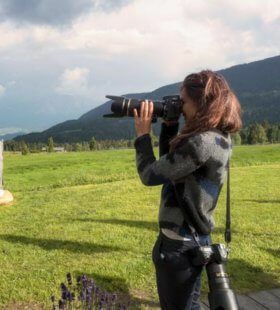 Our local photographers in Trento know exactly what gives the city its singular atmosphere and will make sure to preserve your vacation experience in stunning photographs.